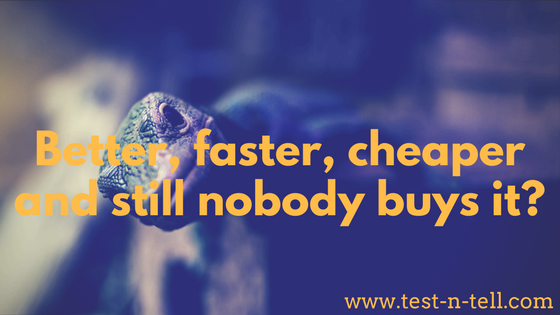 Better, faster, cheaper and still nobody buys it? Outline a process people currently follow to get things done - Remove some steps = Profit. The more steps you remove - the happier people are. Easy, right? Why then is the real innovation still so difficult? One sunny autumn afternoon I stepped into a tall office building somewhere in Central Europe. I had an interview scheduled with the head of HR in a huge company that occupied a tall building, and many other buildings around the world. The company in question employed thousands of people, and they constantly searched for more. I took my badge at the reception, went through the metal detector and into the elevator. On the twenty-something floor, I went through the long dark corridor and entered the windowless meeting room. Few minutes past the due time the place started to fill up. I thought I'll have only the head of HR to talk to, but instead, there were about 10 people. I just had an hour slot, so I've started right away, asking about their biggest challenge. - In the following 12 months we have to hire 13 thousand salespeople, - was the answer I received. - Wow, - I thought, - that's the definition of an ambitious challenge. So I followed up asking about their current process. The description I heard made my jaw drop. - We have lots of regional offices. We post our job listings in local media, people send their applications to the local offices. Then a local HR team in every office puts applicants in an excel file and sends it to the head office. Here we combine all applicants into a one, master excel file. We eliminate duplicates and do a short screening. Then we send the master excel back to regional offices to follow up with candidates according to their geography. The story goes further, but I guess you got the point. They used extremely labour intensive, manual process. Nevertheless, I was thrilled. The perfect case for me. As I was in the process of creating a new piece of software that would solve all the problems those folks had. Fast forward several months and I am back in the tall building. But this time I have a prototype to show. I have roughly the same audience that the last time and they all would try the prototype. As tests progressed, my worry grew. Reactions were mixed, to say the least. The head of HR body language promised nothing good. I tried to rescue the situation and at least understand what we got wrong. But our software was not the problem, as it turned out. We missed the more significant bit. The Resistance. More precisely, human's resistance to change. Natural motivation to keep their position, preserve their status. You see, our software worked. It was innovative. It took steps away. Steps that previously were performed by staff. If the company adapted our software, it would mean staff cuts. Lots of people would lose their jobs. The head of HR would lose his power as his direct reports shrink. Needless to say, this company hasn't bought our software. The lesson I received was harsh and bitter, but I am ever grateful for it. Every recipe has a secret ingredient. Removing steps still works. But, so does our "lizard brain". You can hear a thousand times about the importance of thinking about the "lizard brain" when you are designing your product. But to experience it once would make all the difference. We create software for humans and humans act irrationally. Not always, but often. And even if we do everything perfectly by the recipe - it is still no guarantee of success. Together with our usual research (valuable, usable, feasible), we should remember to do an additional emotional labour to understand what our customer's "lizard brain" fears? What motivates it? And how our solution might be perceived on the emotional level.